If you have a large piece of land, a farm or are even working for a prolonged period on a building site, there sometimes comes a point where you could do with some extra space. The extra space can be used for protecting vehicles and tools from the elements, as well as also provide you a secure storage facility to make sure everything can be kept safely. The cost of building a permanent structure often prohibits building something from conventional materials, so what alternatives is there that are available, and will not break the bank? An excellent alternative would be a dome shelter that is made from shipping containers. The concept of a dome shelter is quite simple and straight forward. You take some shipping containers and arrange them in a way that will allow you to have the shipping containers make three walls, with one wall missing. What you do then is place a dome shaped roof over the courtyard area in front of the shipping containers. What this then gives you is an area that is mostly protected from the elements, and also gives you access to the shipping containers themselves. The shipping containers allow you to have a secure area where you can store tools or equipment, and you can even convert one into a rest area or canteen. What is great about a structure such as this is that they can be set up very quickly, but they can also taken down and moved to a different location if need be. Shipping containers are available in a variety of different sizes and the most common ones used are either 20 or 40 foot in length. The larger the shipping container, the more you will pay for it, so you will need to work out your budget precisely. When you have worked out your budget, you will then be able to create a design accordingly and work out exactly how big your dome shelter will be. You can build a dome shelter using just three shipping containers, or you can use more, it all depends on what exactly you require. The size of the dome can also vary quite substantially with a smaller dome roof being just over 5 meters wide, right up to almost 16 meters wide. With a large dome roof almost 16 meters wide, you will be able to park a couple of large vehicles underneath the roof. If your structure is going to be temporary, and will only be up for a short period, then the groundwork required for erecting the structure is very basic. Of course, you are going to have to make sure that you have all necessary permissions before you start to set your dome shelter up. If your structure is going to be up for the foreseeable future, then you will be better off making some basic foundations on which the structure can sit. You may wish to lay concrete foundations if you are not looking to move the shelter, but at the very least you should clear and flatten the land that the structure is going to sit on. If you are going to go to the trouble of building some foundations, then these will not have to be very deep. The benefit of having a shallow foundation is that you will not have to use too much concrete, depending on how big you are going to make your shelter, of course. If the foundations are pretty shallow and not much concrete has to be used, which means that you will also not have to spend too much money. 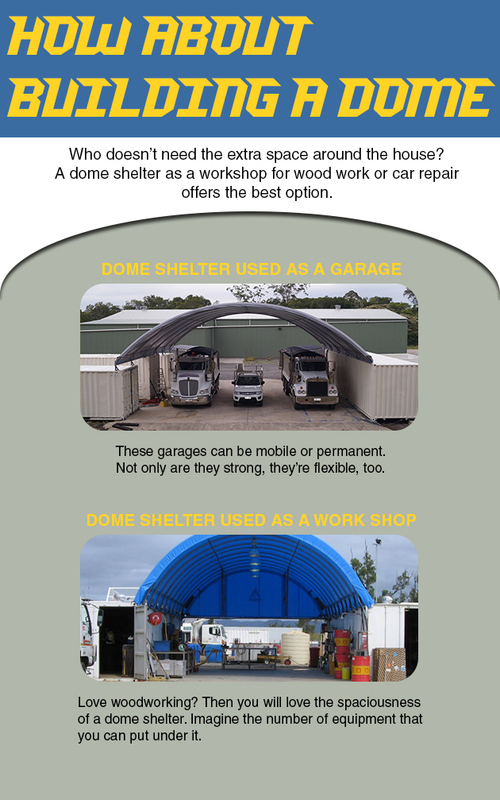 Whether you need additional space to park your vehicles or even a workshop so you can repair them, a dome shelter is the perfect solution. According to Port Shelters Australia, one of the most appealing things about these shipping container structures is their mobility, as well as their strength. There are many different ways that you can design your dome shelter, and you can use as many or as few a shipping containers as you want. As mentioned before, you do not even have to have a foundation in place, as long as the ground is clear and flat. All it will take is a few trucks to drop of the shipping containers and put them in place while another brings the roof and required accessories. The main structure can be set up very quickly, usually within a day, so you can start to use your dome shelter almost as soon as the parts are delivered. Then, when you are ready to move the dome shelter to a new location, the roof can be taken down just as easily as it was put up. A few trucks can come along and pick up the shipping containers, and then your structure is on the way to its new destination, right where you need it. The cost of building a comparable structure out of traditional materials will eclipse the cost of your dome shelter. Also, with a traditional built structure it is a lot more time-consuming to build and also take down if that is even possible. So if you are looking for a mobile and cost effective workshop or storage solution, look no further than a shipping container dome shelter.